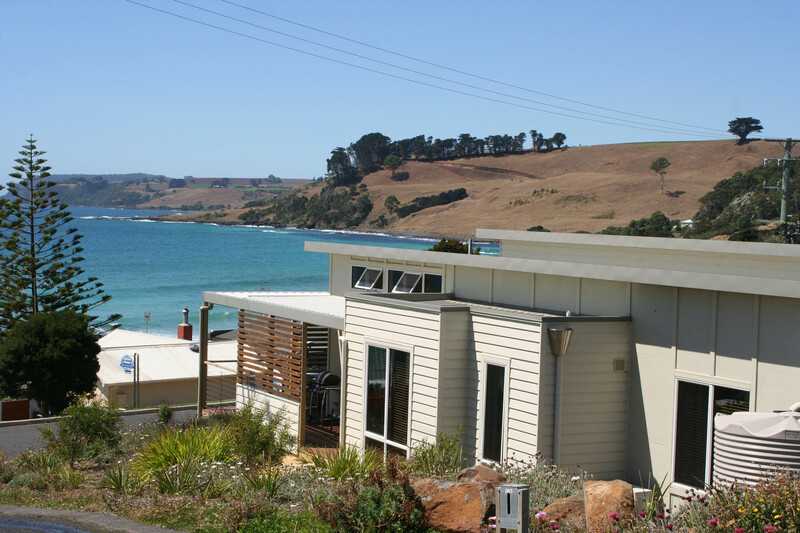 Paradise House provides contemporary, self-contained luxury accommodation at Boat Harbour Beach in north west Tasmania. The famed pristine white sands and crystal clear sea are just 38 steps down in front of Paradise House. The architect-designed holiday house accommodates up to six guests and has a master bedroom with queen bed and quality en suite, second bedroom with two single beds and a third bedroom with good quality double sofa bed + portacot. Bi-fold doors enable this room to become an extension to the spacious living area. Bedrooms have fitted wardrobes, all bedding, towels and electric blankets. There is a second bathroom and separate toilet. The open plan, state-of-the-art kitchen is appointed with a dishwasher and the contemporary lounge and dining area has a flat screen television, high-speed internet, books and games. All rooms enjoy magnificent coastal views and verandas include a barbecue. An internal lock-up garage has laundry, baby chair, gas BBQ, surf and boogie boards, wave skis, snorkels, flippers, fishing rods, and bicycles and ball game equipment. Paradise House, located in a most beautiful seaside village on the north west coast, is 15 minutes drive from Wynyard Airport and just over 90 minutes from Cradle Mountain.